Hubs for these assemblies have a 2.280'' counterbore. A standard length crank bolt is used and the mandrel bolts to the 3 pulley mounting holes. This eliminates the 4'' - 6'' long bolt that is ineffective in retaining torque. 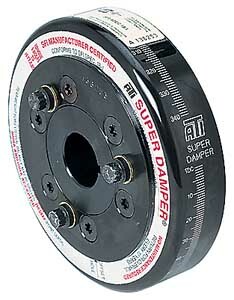 These damper assemblies are used 100% by NASCAR Cup, Busch Grand National and most endurance engine builders. Adapter part # 085-916321 is available for existing mandrels with 1.245'' pilot.